One of the key areas you want to work on during an electric car conversion project is the transmission. The transmission is a little more challenging. The transmission was originally designed to coupled to a clutch plate. 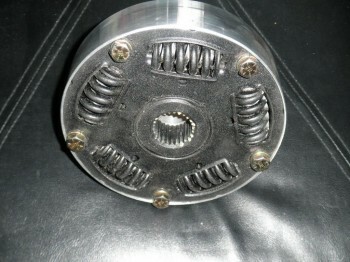 When you are building a Do It Yourself (DIY) electric car, you are not going to use a clutch. The electric motor will be coupled directly to the transmission. The main thing the clutch does for a car is allow you to leave the internal combustion engine running when the car isn’t moving. With an electric motor, you can just switch it off. The other reason you don’t want a clutch is to minimize the amount of mass or the amount of weigh the electric motor has to spin because that will cost you valuable energy. When the electric motor has to spin a bigger resistant, it will consume more electricity hence making your EV less efficient and it won’t go as far. When connecting the electric motor to the existing transmission unit, most EV retrofitters will use the Lovejoy metal coupler. Putting the coupler on the motor shaft is easy. But how do you put the coupler on the transmission shaft? Reason being, the end of the transmission shaft has grooves and teeth while the coupler doesn’t. To solve this problem, you need to have some creativity and do some modification. You start out by removing the old clutch plate. Look at how the plate is attached to the transmission shaft. You will see a little coupler in it that had ridges that matches up to the shaft of the transmission. Cut out that small coupler and weld it to the center of the Lovejoy coupler. Make sure the weld is strong so it does not spin. The Lovejoy coupler with the old clutch plate ridges can now be fitted to the transmission shaft. It is a lot of work, but that’s how you solve a problem in a DIY project. Once you have all the couplers in place and the rubber spider separator in between, you can now connect them together and be able to transfer power from the electric motor to the wheel of your electric car. One of the advantage of the Lovejoy couplers is it allows for a small amount of shaft misalignment. If your electric motor is not perfectly align with the transmission, it is not going to create much problem. It would not handle too much misalignment though, only one of 2 degree, but it’s better than trying to hard weld two of the shaft together on a straight line. You will never get the line perfect. Looking for more information about DIY electric car conversion? If you do, check out Gavin Shoebridge ‘s Electric Conversion Made Easy e-book. Gavin is from the land of kiwis, New Zealand and he has personally converted his old Mitsubishi Tredia into an EV in his garage. For more creative tips and tricks to convert a gas guzzler to EV, check out his manual. This answers my questions regarding the clutch. The less moving parts the better in my opinion, and the thought of not having to worry about a clutch plate ever again really appeals to me! The Lovejoy Coupler sounds like something out of a cheezy science fiction novel, and not like the revolutionary interface that it truly is! are there any electric motor that you can couple right to the drive shaft so you could skip the transmission and save some power ? Hi Lester, you can try looking into the Warp 9 electric motor.